Musa Syeed is a master of silent characters. He filled his previous film, “Valley of Saints” (2012), with people who spoke little with words, but much with expressions. His new film, “A Stray,” offers the same. 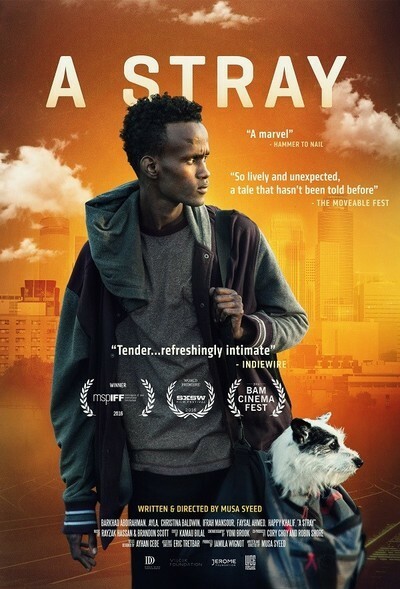 While his previous film took us into the lives of two friends in colorful Kashmir, this film follows a young man through the little-seen, vibrant world of Somali refugees in Minneapolis. For many viewers, this terrain will be just as foreign. These are quiet films with heavy emotions. The film opens with Adan (Barkhad Abdirahman, “Captain Phillips”) staring at a canary sitting in a cage. Frustrated that his friends will not speak to him with respect—because he has no money and does not work—he releases the bird, which soon crashes into a window and dies. That is the direction his own life seems to be taking. He sees himself in that canary; many of the shots in this film show Adan either looking into cages or squeezed in tight spaces. He is a young, astray man who cannot help but break rules, alienating everyone. He has conversations in his head with the Divine, wondering about his place in the world. He casually tells people, “I’m bad luck.” Rather, he is a square peg in a round hole, the young man who cannot fit anywhere, so he seems rebellious, but cannot help it. His mother has given up on him, and kicks him out of her home. The local Imam lets him stay briefly in the local mosque, and prays with him to find forgiveness and a friend. Soon, his prayer gets answered: he meets a restaurant owner who gives him a job delivering food. As he drives on his first assignment, his car hits a stray dog, and from there, the story unravels. The dog here is, for Syeed, a conscious choice (as opposed to a cat). Many Muslims regard dogs as so filthy that they do not let them in their homes. Adan has a moment of pause when he has to pick up the dog, but takes him on what becomes a sort of road movie through Minneapolis, looking for a home and a way to part from the dog. Forgetting to deliver the food, now he tries to figure out how to take care of the dog, trying veterinarians and animal shelters. There is a sequence in the Coen Brothers’ “Inside Llewyn Davis,” in which the title character has to handle a runaway cat, which plays comically. Here, Adan’s relationship with the dog becomes the film’s foundation, taking us through the story of a stray man caring for a stray dog. Every place he goes with the dog, one or both of them are not welcomed. Further, the dog becomes a symbol of Somali integration, in how the various characters—Somali or not—interact with the dog. Some welcome. Some are repulsed. Some caress. Some play. Some fear the dog. Some, through religious obligation informed by the same Islam as the others, are concerned for the dog. Syeed manages to pack in many subplots and themes given this tight film is less than 90 minutes long. Adan’s mother believes he has stolen her jewelry. Adan meets a small group of Native Americans, getting into a conversation with them about immigration. The Somalis in Minnesota seem to get news attention either in cases related to terrorism or cab drivers refusing to deliver alcohol. This film touches on terrorism through a subplot involving FBI surveillance, with an entertaining climax as Adan must translate a very personal, intimate phone call from a local to a religious scholar in Somalia, which an agent believes relates to national security. Syeed takes us deep into the communities, showing us exactly what we should expect: people making ends meet while they find their place in their new world. The neighbors are friendly, unlike the overall immigration and security agencies which discard refugees until they spy on them. Films exploring the foreign tend to be exploitative, emphasizing stereotypes, or they tend to be anthropological exercises by liberal westerners exploring the “savages.” Despite my extensive experience across Muslim America, I have not spent time in these Somali communities. Syeed’s work, however, provides a sense of authenticity, through casual conversations, close-ups that are not preceded by establishing shots that soon reveal elements off-screen, and attention to small details, as though we are present in these worlds as much as we are watching them. In addition to being a tender film about a man finding redemption in caring for a canine, Syeed’s pious film is refreshing, showing us a corner of America that we never see.